From the New York Times best-selling author of Sarah’s Key and A Secret Kept comes an absorbing new novel about one woman’s resistance during an époque that shook Paris to its very core. The House I Loved is the latest release by the author of the absolutely heartbreaking and moving "Sarah's Key" and "A Secret Kept". I loved Sarah's Key, I didn't particularly like A Secret Kept - I really really really wanted to love "The House I Loved" in the same stroke as "Sarah's Key". I went into the novel with high expectations, the novel was 'pumped' on several book sites - amazon and audible both suggested that I read the novel - I had already plugged it into my listening queue before these plugs, waiting for the February 14th release date. The result of "The House I Loved" was a plotless love story, a series of letters from a widow to her dead husband as Paris suffers growing pains at the feet of 'the emperor' and huge sections of the city are destroyed to make way for social progress and new streets. The net result was a feeling that I was sad for the old woman, who very much loved her dead husband (alzhiemers) and son (who died in childhood) but resented and alienated her daughter. The result is a sad widow who is pretty much alone at the end of her life in a home that is equally doomed. There is nothing uplifting in this novel and without a plot the result is just a series of letters about a house and a woman that will be destroyed by progress. I hoped for more. 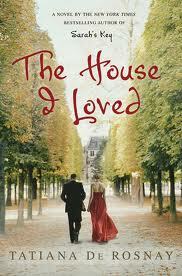 The House I Loved was written by Tatiana de Rosnay and published by Macmillian Audio with a release date of February 14th, 2012. The House I Loved was narrated by Kate Reading and has a runtime of 5 hours and 56 minutes. From 'winter' to late spring..